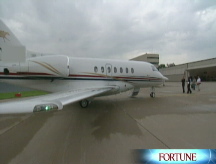 Fortune's Sue Zesiger Callaway hops a ride on the Hawker 4000, a $21 million aircraft that boasts cutting-edge avionics. Plus: Jet etiquette. CEO Jim Schuster with Hawker Beechcraft's new jet. Which jet should you get? If you're doing business at 40,000 feet, you should have the right plane. Here are four of the most wanted. Which is why I was particularly curious to take a joy ride in July on the brand-new Hawker 4000, the first plane to offer big-jet safety and technology features at a midsized-jet price. Okay, so it's still $21 million. But consider: It's $2 million cheaper than a Gulfstream G200 and $7 million less than a Falcon DX, and it has a range of 3,280 nautical miles - that's coast to coast or New York to London nonstop. The 4000 boasts cutting-edge avionics, auto throttle, and multiple duplicate systems (for safety) unavailable in comparable-size jets - only on the big boys. Hawker Beechcraft is also the first manufacturer to certify a composite-body jet with the FAA. "It was six steps back to do composite," says chairman and CEO Jim Schuster of the 20-year, $1 billion development process. But the resulting body is 70% stronger than aluminum, doesn't corrode, is easier to repair, and has no life limit. Amazingly, the fuselage is composed of three enormous pieces - vs. more than 10,000 on a traditional competitor. It's also three times thinner, meaning there's noticeably more room inside the standup, flat-floor ten passenger Hawker. Tucked into its fine leather - HBC offers limitless leathers, woods, and exotic materials - I felt the obvious power during takeoff. The next thing I noticed was the relative peace: The 4000 has the quietest cabin in its class. There's already a two and a half year wait list, in part thanks to orders from fractional-jet companies like NetJets and BJETS, so even those who won't be buying a 4000 may still be able to hop aboard one soon. So you have friends in high places, and they've offered to bring you along. Follow these rules if you want to be invited back. Ask in advance how much luggage you may bring. Don't take your seat until after the owners find theirs. Never tip the staff. That's entirely up to the owner. Nix bringing your own meal. But offering to feed everyone - preferably by air caterer - is a nice gesture. Skip the red wine. You don't want your hosts to remember you every time they see the stain on the carpet. Arrange for transportation when you land. Asking for a lift is an inconvenience.